You can't go anywhere in Torquay without seeing a surfboard, especially when you park outside the Surfing Museum. Iconic surfware brand, Ripcurl was founded in Torquay and their huge store is worth a visit for the historical photos that adorn the walls. 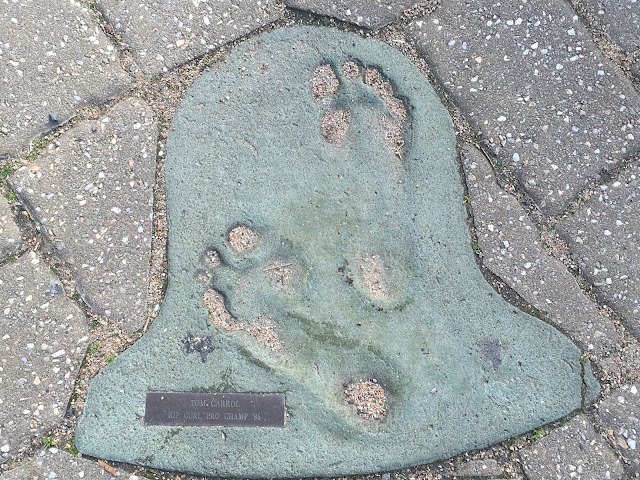 The footpath outside is paved with bells that feature the footprints of surfing pros such as Barton Lynch and Tom Carroll. The Museum holds a collection of memorabilia from across the years, from boards to wetsuits, clothing and photos. A wooden boardwalk allows you to see the vast display of surfboards on the wall, from longboards of the 50's and 60's, to the sleek fibreglass models of recent times. A shaping bay allows you to watch as a board comes to life. 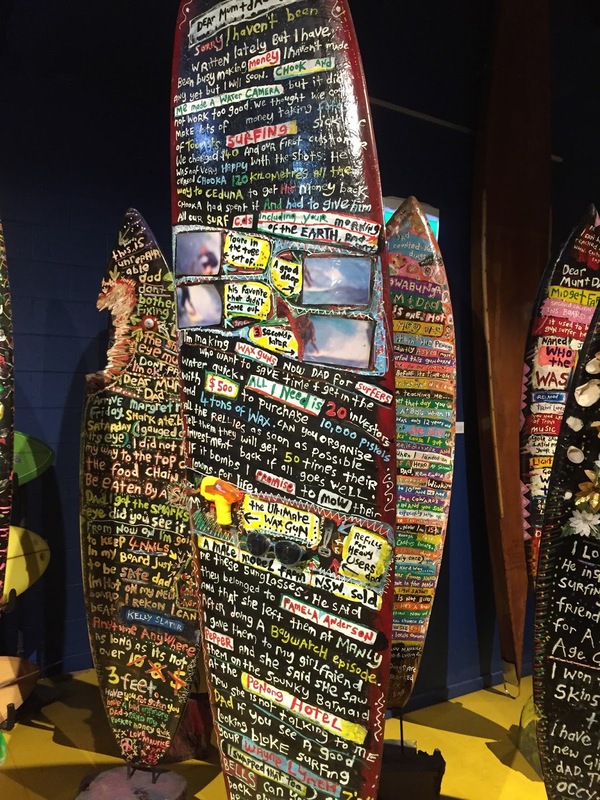 The Hall of Fame features replica boards used by surfing legends, along with a detailed history of those surfers. 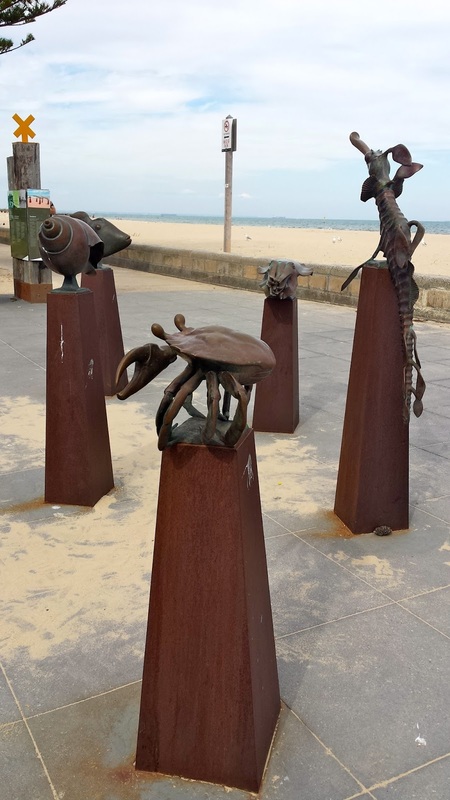 Among the many male surf champions featured, there was a few high profile females as well, such as Layne Beachley and Pam Burridge. ...but another Gabby (younger, prettier, Spanish speaking), chalk in hand, wrote her name instead - before my very eyes. My kidlets were amazed at the coincidence and had a giggle about it. Not to be outdone by my namesake, I drew a Frangipani on the other board. We sat and watched some jaw-dropping thrills and spills in the theatre as surf films played throughout the day. The famous Bell Trophy plaque was on display, with names etched into it from as far back as 1962's Bells Easter Rally. 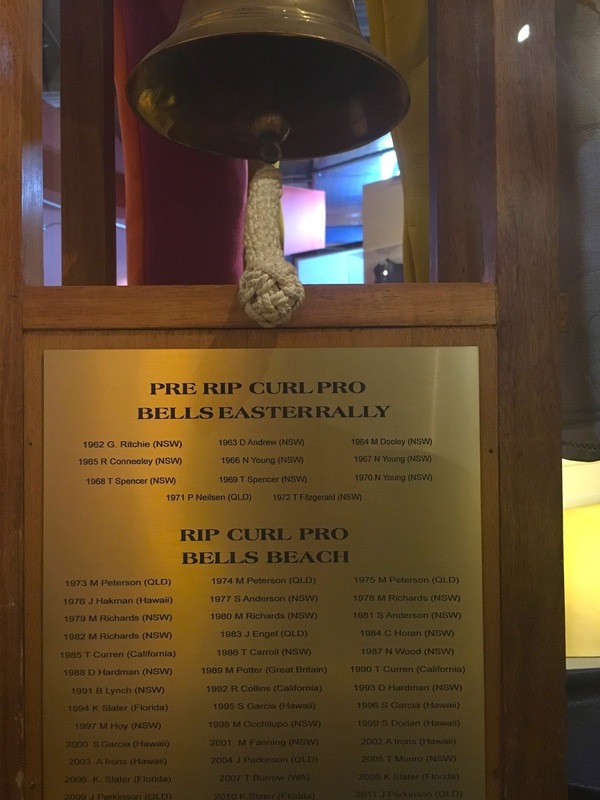 The Rip Curl Pro began in 1973 at nearby Bells beach, and the plaque features names like Americans Tom Curran, Kelly Slater and Andy Irons, and Aussies Mark Occhilupo and Mick Fanning, to name just a few. The ultimate surfers vehicle, this Kombi was decked out in all sorts of gear and cut out in the middle to create a walkway. Totally rad, dude. My favourite exhibition of the Museum was this collection of Storyboards by local artist, Gordon Stammers. The front of the board has a letter from a young surfer, Maurice, to his father, detailing his adventures on the road. On the reverse side, Maurice's Dad responds to his son, with advice and stories from home. Incredibly funny - make sure you allow at least 30 minutes to stand and read them all.